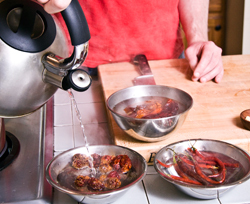 Pour boiling water over dried chilies in a bowl (enough to cover). Press down with spoon to make them submerge. Soak your chilies for 15 minutes. Discard water when done (do not use in recipes like you would water from reconstituting dried mushrooms). 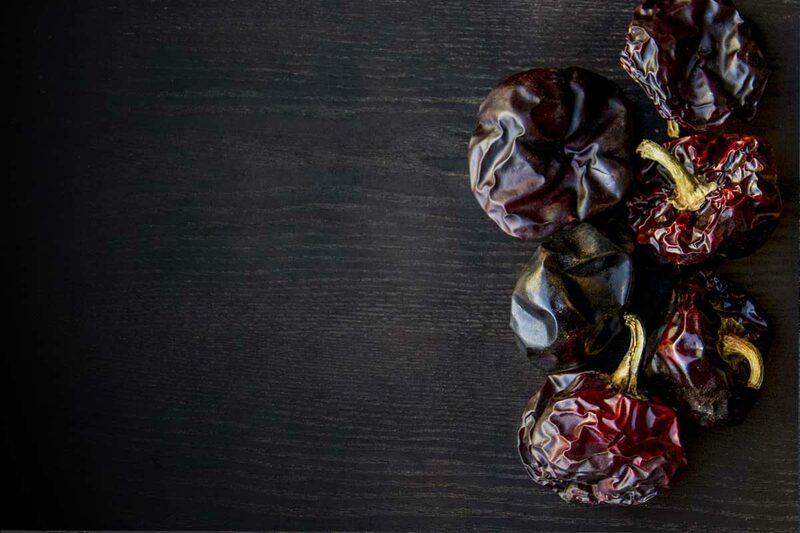 Some peppers plump up more than others when ready, so do not be alarmed if your chilies still have slightly papery skin. Deseed peppers by removing tops and slitting down sides (you can leave the seeds in if you would like, but your chilies will be significantly hotter). My 20 year old son just moved out 2 weeks ago, whom I’ve raised on my own since I left my husband when he was 6 months old. We’ve been each others best buddies and I’m in the TOTAL empty nest thing. I’m doing fine and we’re doing a Friday night dinner(which is more than I got when he still lived here)but I would love to surpise him with these. He’s never had them but I told him how I did once when I was a little girl and have never forgotten. We’re both foodies(on a limited budget). I would definatly batter fry some and reseach other great recepies for the rest! I’m thinking crab legs or lobster to compliment. Thanks for this opportunity to make a great evening even better! Pingback: Chile Berry Cooler Recipe « Eat.Live.Blog. Pingback: Smokey Spiced Summer Bruschetta « Eat.Live.Blog.